Supply chain challenges in the South African automotive sector: Do location, size and age matter? The South African automotive industry makes an important contribution to the South African economy. However, there are deficiencies within the local automotive component manufacturers' (ACMs) supplier base and therefore automotive assemblers, or original equipment manufacturers (OEMs), have to import many of their parts requirements. These deficiencies are caused by ACMs' lack of technology, global supply capability, cost competitiveness and their geographic location (ACMs are scattered across the country). A study was conducted to explore the supply chain challenges South African ACMs face and whether the location, size and age of participating ACMs have a bearing on whether they face the same challenges. The results revealed that the most significant supply chain challenges in South Africa were in the customer relationship category. From the hypotheses testing, the conclusion could be drawn that, in general, participating ACMs face common supply chain challenges, irrespective of their location, age and size. This article contributes to the published research on the topic and the findings reveal that business opportunities in the automotive industry exist for entrepreneurs aspiring to enter into the automotive component industry. 'A successful automotive industry is often seen as a symbol of economic success and as a sign of mastery of modern technologies' (TISA, 2003:3). The automotive industry has grown to become the leading manufacturing sector in South Africa's economy, and as a result of its growth, is recognised as a mature industry (Bandyopadhyay, 2010). The industry contributed 6.2 per cent to the country's gross domestic product and employed a total of 93 100 people in 2010 (AIEC, 2011). In terms of its international contribution, South Africa was responsible for approximately 73 per cent of Africa's vehicle output and produced 0.61 per cent of the world's vehicles in 2009 (OICA, 2010). For example, in 2010, the automotive industry exported 11.9 per cent (to the value of R585 billion) of the total exports from South Africa, mainly to China, the USA, Japan, Germany and the United Kingdom (AIEC, 2011). However, the local content in vehicles produced in South Africa is only 35 per cent. Automotive assembly plants have to import too many parts as there is a lack of local suppliers in the markets (Ambe & Badenhorst-Weiss, 2011; Pitot, 2007). Automotive assembly plants have to import too many parts as there is a lack of local suppliers in the markets. The automotive supply chain consists of parties, links and logistical processes that function together to deliver the end product to the final customer. Globally, the industry is very competitive, and world-class management philosophies and practices such as just-in-time production (JIT), total quality management (TQM) and continuous improvement (CI) are already in use in these supply chains, and have been for many decades (Naude, 2009). Despite the use of these management practices, the industry's supply chains face realities and challenges that have an impact on delivery in terms of components being delivered at the right place and time, and higher inventory holding at every stage of the supply chain if logistical services are unreliable and irregular. The South African automotive industry compares favourably with similar industries in developing countries with regard to infrastructure, raw material availability, emerging-market cost advantages, flexible production capability and government support. However, despite these positive aspects, the South African automotive industry's competitiveness is under severe pressure (Barnes, 2009), as it experiences challenges such as high labour costs, poor infrastructure and dated technology. This is particularly true with regard to South African ACMs that compete against cheap imported parts and, in some cases, counterfeit parts (Ambe & Badenhorst-Weiss, 2011; Moodley, Morris & Barnes, 2001). As a result, increasingly demanding customers are squeezing component manufacturers on both price and non-price factors (Barnes, 2009). The survival and growth of these ACMs in an increasingly competitive global market are vital for the South African economy. ACMs will only grow if they are able to compete globally. Given the above context, this article explores the supply chain challenges South African ACMs face. It provides insight into whether the ACMs' geographical location, size with regard to the number of employees, and age have a bearing on whether they face common challenges. Mazzarol and Choo (2003) observe that one of the challenges facing businesses is deciding where to locate the business. This decision is critical to future success as poor selection of a business location can have a negative impact on the business's access to markets, suppliers and labour. The South African automotive industry grew organically over a considerable period of time, and automotive assembly plants are based in Pretoria, Johannesburg, Port Elizabeth, East London and Durban. As a result, their supplier base is scattered across the country, with the greatest concentration being in Gauteng and Port Elizabeth. The size and age of a business may have various implications for its performance, some positive and some negative (Aldrich & Auster, 1986). For example, very young businesses may enjoy the advantage of owner/founder commitment and involvement, but are also likely to be deficient in resources such as financial capital and expertise, which could have a negative impact on their relationships with suppliers and customers (Brush & Chaganti, 1998). This article is based on a descriptive and exploratory study that includes a brief review of existing literature, informal semi-structured interviews with automotive assembly plants and an opinion survey questionnaire among ACMs. The article comprises four sections: (1) a literature review, (2) the research methodology, (3) the analysis of the findings and 4) concluding remarks. 1) Original equipment manufacturers (OEMs) or automotive assemblers. This category comprises both passenger and commercial vehicle assemblers. 2) Automotive component manufacturers (ACMs). The ACMs supply components to OEMs, original equipment suppliers (OESs) and the independent aftermarket. The ACMs can be seen as the first-tier supplier in the automotive supply chain. 3) Original equipment suppliers (OESs). This category comprises automotive parts and accessory sales through the OEMs. 1) From a geographic perspective, do ACMs in South Africa face the same supply-chain challenges? 2) Do the size and age of a business have a bearing on the supply challenges it faces? Producing products with shorter life cycles, strong competition among businesses and a high level of customer satisfaction in today's global market have forced organisations to focus more on their supply chains (Manzouri, Rahman, Arshad & Ismail, 2010). The concept of supply chain management (SCM) is described in various ways. Drawing insights from the literature, an effort is made to determine the various dimensions and key factors in the SCM approach. Hugo and Badenhorst-Weiss (2011) acknowledge that the movement of materials through the supply chain is the core of any supply chain, since it is essentially aimed at creating a competitive advantage by providing outstanding customer service (by means of delivery). This enables a company to differentiate itself from its competitors in the market and enhances current and future profitability by balancing costs and service levels. encompassing the planning and management of all activities involved in sourcing and procurement, conversion, and all logistics management activities. Importantly, it also includes coordination and collaboration with channel partners, which can be suppliers, intermediaries, third-party service providers, and customers. In essence, SCM integrates supply and demand management within and across companies. Other scholars view SCM as a collaborative approach within and across companies that includes various role players in the supply chain, who significantly contribute to improved product quality, shorter lead times, and a higher responsiveness of the supply chain, at lower cost and improved customer satisfaction levels (Bennet & O'Kane, 2006; Humphreys, Huang, Cadden & McIvor, 2007; Lockström, Schadel, Harrison & Moser, 2009). From these definitions, it is clear that SCM includes all those activities involved in the flow of materials through the supply chain, that SCM extends from the ultimate customer back to Mother Earth, and that there is some kind of relationship, collaboration or cooperation between supply chain parties. Therefore, SCM in the manufacturing of motorcars can be regarded as the inputs needed at each level or tier of the supply chain, to be transformed into finished automotive components. Inputs include information from customers, raw materials, inventory, equipment, machinery, labour and finances. The transformation process is the management of the modification process that converts inputs (such as raw materials and labour) into outputs (finished goods and services) that are distributed to the customer at the next lower level of the supply chain. This process is continued at all levels of the supply chain until the end product (the motorcar) reaches the final customer. The size of a business is measured by the number of full-time employees and the age of the business is measured by the number of years it has been in operation. Among the structural characteristics of businesses, size and age have been emphasised as particularly important features of the economic outcome (Loscocco, Robinson, Hall & Allen, 1991). In South Africa, it is recognised that small and medium-sized businesses have a significant potential to generate employment and thereby alleviate poverty (Booyens, 2011). As indicated by Lepoutre and Heene (2006), small and large businesses basically possess different resourcess and capabilities such as: financial turnover; assets, market share; numbers employed; and ownership. Small businesses have less access to resources and are less powerful than their larger counterparts. Business size and business age are recognised to be two of the determinants of a business's inclination to innovate and of business growth (Evans, 1987; Booyens, 2011). As not much research has been undertaken to determine whether a business' size and age have an impact on the supply chain challenges it faces, one of the objectives of this article is to compare the supply chain challenges ACMs face to their age and size, and to determine whether these are statistically significant. In this study, most of the responding ACMs (24.5 per cent) had been operating for between 11 and 20 years; 17 per cent had been operating for 21 to 30 years, and another 17 per cent for 41 to 50 years. The remainder of ACMs had been operating for 1 to 10 years, or 51 to 60 years (11.3 per cent each) (Figure 1). One could therefore say that the responding ACMs were mature and well established (88.7 per cent were older than 10 years), an assessment that ties in with the literature indicating that the automotive industry in South Africa is mature (Bandyopadhyay, 2010). 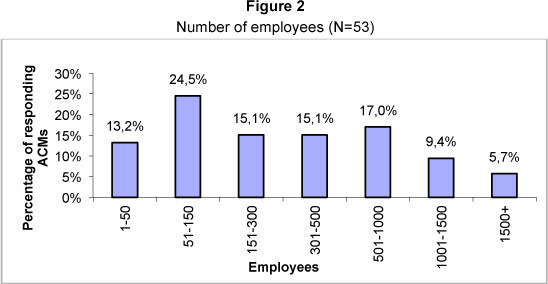 The size of automotive component manufacturers is measured in terms of number of employees (NAACAM Newsletter, March 2009). As can be seen in Figure 2, the responding ACMs in this study employ a total of 29 346 workers. It is clear from Figure 2 that 37.7 per cent of the responding ACMs employed between 1 and 150 employees, and 47.2 per cent between 151 and 1 000 employees. It is important to note that 9.4 per cent of responding ACMs employed between 1 001 and 1 500 employees and 5.7 per cent more than 1 500, making it impossible to generalise the findings as being applicable only to, say, small-to-medium or large ACMs. 'Location, location and location' is a well-known phrase in marketing and has been identified as the one of the most important determinants of the value of a property (Nieman, Hough & Nieuwenhuizen, 2008; Stevenson, 2012). The right choice of location is vital for a new business venture or for existing businesses that are investigating expansion opportunities. Poor selection of a business location can have a detrimental impact on a business's access to suppliers, customers and labour (Mazzarol & Choo, 2003). The selection of a suitable location can improve the competitive advantage of a business. The advantages could include an increase in production capacity, additional profit, an increase in shareholders' wealth, improved service delivery and a reduction in costs (Jungthirapanich & Benjamin, 1995). Pycraft, Singh, Phihlela, Slack, Chambers and Johnston (2010) indicate that the objective of the decision on where to locate a business is to achieve a balance between: (1) the spatially variable costs, (2) the service level the business is able to offer its customers, and (3) revenue potential. Nieman, Hough & Nieuwenhuizen (2008) identify access to markets, the availability of raw materials, support and technical infrastructure, transport infrastructure, the availability of labour and skills, climatic conditions, and political and social stability as factors that have an impact on the physical establishment of a business. The automotive industry in South Africa has grown over a number of years and is geographically dispersed across three provinces: Gauteng, the Eastern Cape and KwaZulu-Natal. Most of the major global OEMs are represented in South Africa and are located in three of the country's nine provinces. These vehicle manufacturers include BMW, Nissan, Fiat and Ford (incorporating Mazda) in Gauteng; Volkswagen, DaimlerChrysler and General Motors in the Eastern Cape; and Toyota in KwaZulu-Natal. It is estimated that there are 300 ACMs (which supply these OEMs) and another 150 spread throughout the country, producing parts for the automotive industry, as well as for other sectors such as light engineering, mining, construction and defence (South African Automotive Yearbook, 2008). Just under half of these suppliers are located in Gauteng, a third in the Eastern Cape, a quarter in KwaZulu-Natal and a few companies in the Western Cape (Mbiko, 2006). One of the aims of this article is to compare the supply chain challenges faced in the provinces and determine possible challenges related to geographic location. Most of the respondents in this study (34 per cent) are located in more than one geographic area, followed by those located only in Gauteng (20.8 per cent), KwaZulu-Natal (18.8 per cent), the Eastern Cape (18.8 per cent), the Western Cape (5.7 per cent) and North West (1.9 per cent) (Figure 3). This article reports on a study that was conducted to investigate the SCM challenges of ACMs as important role players in the South African automotive industry. The study is by nature descriptive and exploratory, contains quantitative and qualitative aspects, and benefits from triangulation across methods. The study consists of two phases. The first phase of the primary data collection for the research consisted of semi-structured interviews with senior managers at two leading OEMs in the country. These interviews were conducted in order to obtain insight and identify possible supply chain challenges facing ACMs in the country from the OEMs' perspective. The knowledge obtained from the literature and the qualitative interviews was then used to design an opinion survey questionnaire. The opinion survey questionnaire consisted of two sections: section A consisted of the company profile and section B of a number of questions - using a seven-point Likert response format, varying from 1 (to a lesser extent) to 7 (to a greater extent) - identified from the literature review and the semi-structured interviews. The questionnaire also made provision for qualitative inputs in the form of an optional motivation for respondents' answers. The questionnaire was used as a tool to identify supply chain challenges facing ACMs, to consider the reasons for and impact of these challenges, and to seek solutions. The second phase of the data collection process consisted of sending out the questionnaire to all ACMs that were members of the National Association of Automotive Component and Allied Manufacturers (NAACAM). About 60 per cent of the largest and most important ACMs are members of NAACAM. A total of 178 questionnaires were sent out and a response rate of 30.6 per cent was achieved. 3) to compare these challenges with regard to the age and size of an ACM in order to determine whether age or size has an impact on an ACM's challenges. In order to address objectives two and three, three hypotheses were formulated to guide the research. H01: From a geographic perspective, ACMs in South Africa face the same supply chain challenges as one another. Ha1: From a geographic perspective, ACMs in South Africa face different supply chain challenges as one another. H02: The number of years a business has been supplying its target market has no bearing on the supply challenges it faces. Ha2: The number of years a business has been supplying its target market has a bearing on the supply chain challenges it faces. H03: The size of a business (number of fulltime employees) has no bearing on the supply challenges it faces. Ha3: The size of a business (number of fulltime employees) does have a bearing on the supply chain challenges it faces. The completed questionnaires were coded and the responses captured in Excel and then exported into SPSS. Descriptive and mean response ratings were used to determine the significant supply chain challenges of automotive supply chains. The statistical nonparametric tests that were conducted were the Kruskal-Wallis one-way analysis of variance by rank, Spearman's rank order correlation coefficients and binomial tests. In Table 1 the most significant challenges with a mean rating of above 4 are listed together with those that the Kruskal-Wallis test identified as significant challenges in the testing of the hypotheses. It is clear that of the 75 challenges identified, the most significant was in the customer relationship category (that is the relationship between ACMs and OEMs). The Kruskal-Wallis test was used to determine whether the geographic location of the businesses had an effect on the extent of supply chain challenges they faced. 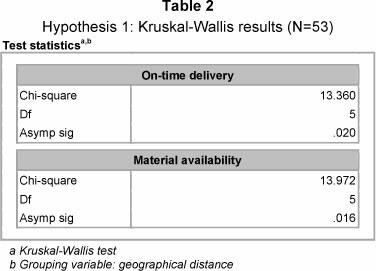 The Kruskal-Wallis test identified only two significant challenges, namely on-time delivery and materials availability. This is indicated in Table 2. The Kruskal-Wallis table gives the Chi-square value, degree of freedom and significance. The values indicate that on-time delivery and material availability do significantly differ across the geographic areas at a 5 per cent level of significance (p < 0.05). material availability (Table 1): 2.98. The hypothesis only tests whether there is a statistically significant difference between the geographic regions with regard to the extent of the supply chain challenges, not if the challenges per se are significant. One could argue that in terms of material availability and on-time delivery, statistically these challenges differ nationally for two reasons. Firstly, the geographic location of suppliers poses a problem because the OEMs' and the ACMs' supplier base is scattered across the country. Hence closeness to suppliers, distance from key industrial areas, and excessive distance from the ports could be a reason for the challenges of on-time delivery and material availability differing significantly from region to region. A second reason could have been the capacity of suppliers, who tend to over commit themselves in terms of what they can actually deliver. This emerged as a problem in the first stage of the empirical research, where one of the participants indicated that from an OEM's perspective, there was a tendency among many suppliers to over commit themselves in terms of what they could deliver. As a direct result, these suppliers were unable to meet the demand for a certain product with all their customers. The perception of over commitment by ACMs could be caused by (1) the ACMs' suppliers, who are not able to deliver on time because of the geographic spread of suppliers, or (2) by the fact that the required material to produce the components ordered may not be available. In view of the fact that of all the identified supply chain challenges faced by responding ACMs, the Kruskal-Wallis test identified only two challenges to be statistically significant between geographic areas, the conclusion could be drawn that in general, from a geographic perspective, the extent to which ACMs in South Africa face supply chain challenges is the same. The objective of hypothesis 2 was to determine whether the age of a company plays a significant role in the type of supply chain challenges it faces. The Kruskal-Wallis test was used to determine whether the age of the businesses had an effect on the extent of supply chain challenges ACMs face. The test identified two significant challenges, namely 'output based on rigid marketing forecasting' and 'integrating technology with suppliers and customers' (Table 3). The Kruskal-Wallis table gives the Chi-square value, degree of freedom and significance. The values indicate that 'output based on rigid marked forecasting' and 'integrating technology with suppliers and customers' did differ significantly across the age of a business at the 5 per cent level of significance (p < 0.05). 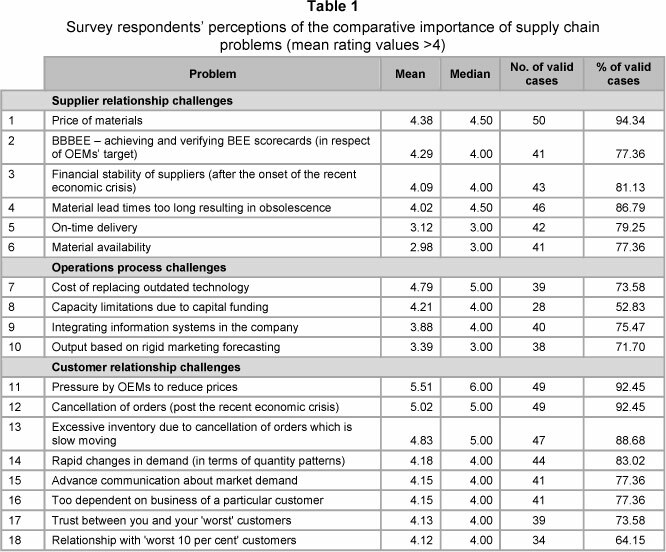 integrating technology with suppliers and customers (Table 1): 3.67. The hypothesis only tests whether there was a statistically significant difference between the age of a business and the extent of the supply chain challenges facing the business. 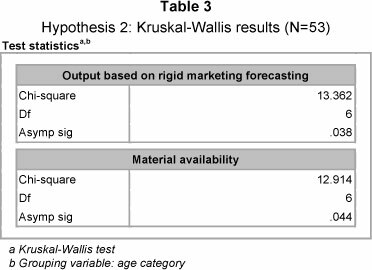 Of all the identified supply chain challenges faced by responding ACMs, the Kruskal-Wallis test identified only two challenges that differed statistically significantly with regard to the age of a business. One could therefore conclude that, in general, the age of a business does not have an impact on the supply chain challenges it faces. However, this result should also be viewed in light of the profile of the responding companies, where 88.7 per cent were older than ten years, 62.2 per cent older than 20 years and 45.2 per cent older than 30 years. The objective of hypothesis 3 was to determine whether the size of a business (number of fulltime employees) has an impact on the supply chain challenges it faces. The Kruskal-Wallis test was used to determine whether the size of a business does have an effect on the extent of supply chain challenges it faces, and identified no statistically significant difference between the business size categories with regard to the extent to which the businesses perceive there to be challenges. One could therefore conclude that, in general, the number of full-time employees or the size of a business does not have an impact on the extent of the supply chain challenges it faces. The South African automotive industry has grown to become the leading manufacturing sector in the economy. Even though the industry is very competitive and many world-class management practices are already in use in the industry, the business environment has changed over the past few years. There is pressure on South African ACMs to compete with the best in the world from a cost and quality perspective in order to survive. The automotive industry is under severe pressure and faces many supply chain problems that are a result of rapid developments in supply chain management, technological advancements, high labour costs, poor infrastructure, globalisation and increasingly demanding customers who are squeezing their suppliers on price and non-price factors. The role of ACMs in the competitiveness and the survival of the automotive industry is vital, as ACMs are the main contributors to employment in the automotive industry and they can make a great contribution to the cost-competitiveness of the South African automotive industry. The research findings indicate that from a geographic perspective only two out of all the identified supply chain challenges are found to be statistically significant. Therefore the conclusion drawn is that ACMs in South Africa face the same supply chain challenges and that the age of a business has no impact on the supply chain challenges they face. With regard to size, the Kruskal-Wallis test identified no statistically significance difference between the business size categories with regard to the perceived challenges experienced by the businesses. In conclusion, this article provides a number of insights, but these should be viewed in terms of two limitations: firstly, only component manufacturers who are members of NAACAM were included in the study and therefore the findings cannot be generalised to all ACMs in South Africa; and secondly, the focus was on the challenges experienced at one stage of the supply chain (at ACMs) and are judged from the ACMs' viewpoint. The article builds on existing research on supply chain challenges in the South African automotive industry and provides a perspective on the topic for potential entrepreneurs aspiring to enter into the automotive component industry. Automotive assembly plants in South Africa have to import too many parts as there is a lack of local suppliers in the market, and this presents an opportunity for trade with aspiring entrepreneurs.